Greetings from SBT Localization team! We hope this year has already brought you joy and success. Despite all the holidays our team managed to work hard and showed its insistence. But first things first. We’ll begin with the projects, which got plenty of attention in January. They are Baldur’s Gate II: Enhanced Edition and Kingdom Come: Deliverance. Sometimes translators get tired and take a vacation. But when they return… they can move mountains of texts. That is what happened this time when Bohdan Peredrii returned to SBT from his vacation. He alone translated more than 1% of one-million word Baldur’s Gate 2. Oksana Ryvko also did a great job here. Nearly 2% of the game (1,75%) was translated in total in January. We are glad to remind you that the Ukrainian voice-acting of Siege of Dragonspear — Beamdog’s expansion pack for Baldur’s Gate: Enhanced Edition — is planned. We are still working on some technical issues but nevertheless it’s a great time to get acquainted with dubbing actors. So if you are eager to help please contact us via email, Facebook or Discord. Translators of Kingdom Come: Deliverance impress us with their persistence every month. As of the time of the report writing, 43% of the entire game has been localized and 9% proofread. Oleksandra Kutsan, Andrii Kozhushko, and Iryna Makovska were the most active translators of the project in January. Even though The Banner Saga is not as huge as projects mentioned above it is quite big. Its localizations goes not as quickly as we’d like but there is some visible progress there. At the moment, 11% of The Banner Saga 3 has been localized and 9% proofread (including 12% of technical texts localized and 4% proofread). Oksana Bukanova, Sofia Shul, and Yurii “Dragon” were the most active translators of the project. The Curious Expedition and Hand of Fate 2 have less progress — 96% (+1%) and 7,8% (+0,6%) respectively. Proofreading of Siege of Dragonspear and Baldur’s Gate: Enhanced Edition is still in progress. 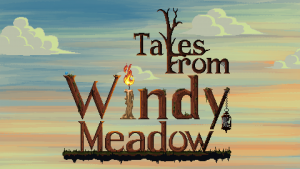 We are aware that we are desperately busy, but we will cope with all of our projects including Tales from Windy Meadow. How could we say “no” to this cute adventurous interactive story? At the beginning we had some difficulties with its unusual file format, but there’s nothing SBT could not cope with! We dealt with everything and by the end of January we translated nearly 5% of the text. Bohdan Peredrii was the most active localizer on this project. 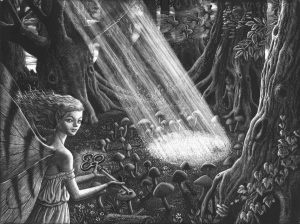 “Svit fantasy”, the web magazine, published our translation of “The Golden Key” , a fairy-tale by Scottish writer George MacDonald. This mystical story about a boy who found an unusual key at the end of a rainbow will not leave you indifferent. This fairy-tale was translated by Tetiana Cherednychok, Andrii Yatsechko, Maksym Duvanov, Mariana Voitseschuk, and Sofia Shul. Earlier we translated two more fairy-tales by George MacDonald which are “The Giant’s Heart” and “The Light Princess”. You can also find them on “Svit fantasy” web-site. Even though these fairy-tales belong to one writer they differ from each other by its mood.”The Giant’s Heart” will be adored by children because of its adventures, “The Light Princess” will amuse anyone but also will make you think over the stereotypes, and “The Golden Key” will make you reconsider your vision of life and death. Moreover, we are proud to work on the translation of “Outsider” comics by Jim Francis. Follow Alexander Jardin’s space adventures on its colorful pages. It’s all started from humans’ migration into the space in order to join another star system communities. But this happens in time of intergalactic war so the spacecraft from the Earth came under fire. Alexander Jardin miraculously survived and appears in the epicenter of war events. Only time can tell who is a friend and who is a foe. Karina Voloshyna together with Sofia Shul streamed King’s Bounty: Crossworlds last month. Our brave ladies conquered magical world of Teana. All the details of their adventures you can experience while watching stream record on our YouTube channel. Unfortunately, our second stream failed because of some technical issues. However, we are thankful to Yurii “Dragon” for being insistent and initiative. We held two giveaways on Facebook in January. Winners got the key for Ash of Gods and for the bunch Metro: Last Light Redux + Metro: 2033 Redux. Also, we published localization research (in Ukrainian) by Dmytro Kozerovskii. His paper will tell you about the difference between translation and localization and distinguish some peculiarities of online videogames localization using the example of “World of Tanks” war simulator. If you are interested in localization — feel free to read this paper. Moreover, we presented to our patrons a set of SBT stickers which one can find in Telegram under the name SBT_fun_line and SBTLocalization. It is also possible to print one of the stickers on a cup which will turn your regular tea into magic potion! 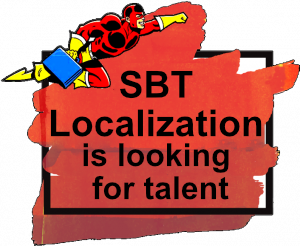 SBT Localization is always on the lookout for new talents. If you are a game localization enthusiast or just want to try, don’t hesitate to contact us through our online form or find us on Facebook, Twitter, or Discord. Even if you have no time to partake in Ukrainian localization efforts directly, you still can help by donating. Send your donations to acc. No. 5169 3305 1649 7846 (if you do it through a payment terminal, be sure to provide your full name so that we know whom to thank) or support us on Patreon. Our heartfelt thanks go to all those who support SBT Localization on Patreon or by any other means. May you all and your families stay healthy, successful and live well! We’d also like to thank Oleksii Ivanov (100 UAH), Yurii “Dragon” (75 UAH), Denys Ovsiannyk ($2), Oleksandra Kutsan ($2), Andrii Kozhushko ($2), Maria Polishchuk ($2), Volodymyr Hryhorash ($2), Pavlo Donchenko ($2), Step ($2), Hlib Kozubov ($2), Yurii Brehman ($2), Oleksandr Lukianov ($2), Oleksii Ivanov ($2), Pavlo Chernitsov ($1), Volodymyr Zhuk ($1), Jarlaxle Baenre ($1). AND A SPECIAL SHOUT-OUT GOES TO IRYNA AND YARYNA FROM CROWDIN FOR THEIR SUPPORT! UKRAINIZATION OF THE UNIVERSE MARCHES ON!